Reinventing personal transports requires imagination, creativity and solid engineering. All these ingredients are well mixed in the Fosjoas two wheel self balancing scooter. The electric scooters are compact, lightweight, easily transportable and maintenance-free, and they stand out as the perfect rides for short and middle distances. While developing the product, all models have been designed keeping in mind both for leisure-time and urban commuters needs. Fosjoas electric scooter is green. Moving through cities in a sustainable way, enjoying the ride, is now possible thanks to the Fosjoas products. Powered by premium rechargeable battery packs, such as Panasonic, Samsung, Sanyo and Sony lithium battery, Fosjoas ensures the range from 18km to 45km with one full charge. Of course, different models have different ranges. Fosjoas is a real personal transportation system with zero-release. Fosjoas is intelligent. When powered on, Fosjoas self-balancing scooter will balance by itself due to its internal gyroscope: a physical device rotation axis realizing stability by the effect of the law of conservation of angular momentum. Intelligent control system of Fosjoas not only makes judgment of kinds of emergencies, but also it can monitor the security systems in real time and give alarm reminding in time. Fosjoas intelligent electric scooters can be monitored by the mobile App. What's more, the riders can learn the current battery lever, temperature and mileage. Fosjoas electric self-balancing scooter is agile as it can be used in combination with other means of transport. Imagine that: you can reach the place by car and leave your car in a parking area, and then make your way through the crowded traffic by Fosjoas. The same applies to public transportation: catch a train or subway from one station to another and move between stations, workplaces and home by Fosjoas, saving time every day. 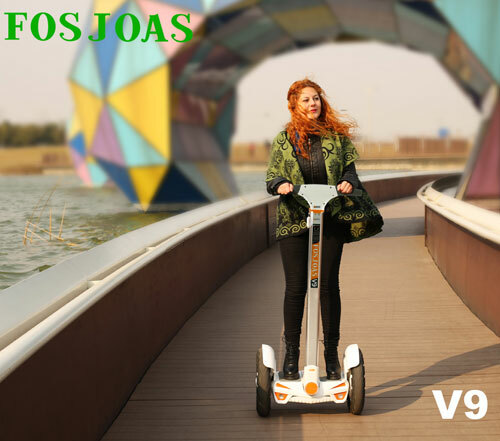 Furthermore, Fosjoas models such as the V9 electric unicycle high quality and K3 are the perfect personal transports for those working within large areas such as airports, stations, exhibition centres, museums and production areas.